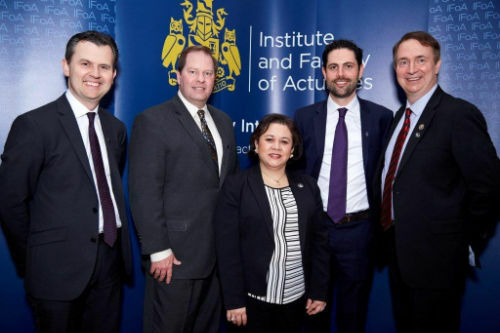 Left to Right: Paul Gates, Chris Boggs, Ana Mata, Adam Shrubshall, John Buchanan at the IFoA Awards Dinner April 2017 receiving the Brian Hey Prize. Buchanan, J.W. et al. (2017) Analyzing the Disconnect Between the Reinsurance Submission and Global Underwriter’s Needs: Property Per Risk. Joint IFoA/CAS International Pricing Research Working Party, to appear in the British Actuarial Journal. This paper was awarded the Brian Hey Prize 2016.